Garmin echoMAP CHIRP 75cv chartplotter has a 7-inch display with keypad control. 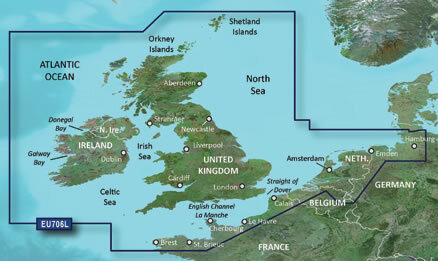 The Garimin Chartplotter comes preloaded with BlueChart g2 maps of UK, Ireland and North West mainland Europe coast and is waterproof to IPX7 standards. Position and heading is updated 5 times every second making navigation very accurate. You will be able to see both below your boat and to the side underwater with this chartplotter (transducer not included). Garmin echoMAP CHIRP 75dv has been discontinued. The replacement model is the Garmin ECHOMAP Plus 75cv. View accessories for the Garmin echoMAP CHIRP 75dv. 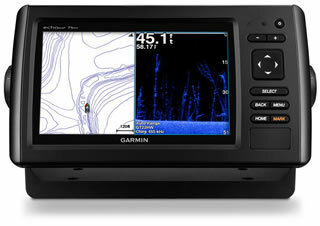 The Garmin echoMAP CHIRP 75cv is a chartplotter with a 7-inch colour display and keypad control. 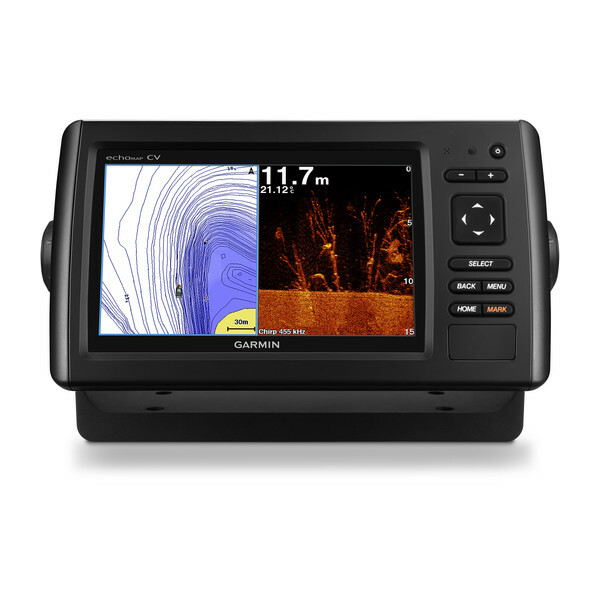 The Garmin CHIRP chartplotter is waterproof to IPX7 standards and is preloaded with BlueChart g2 maps of Uk, Ireland and North West mainland Europe coast. You can use sonar to see where fish are with Panoptix all-seeing sonar support (transducer not included). Also available is the echoMAP CHIRP 75sv which also features Side View (sv) to see not only below your boat but also to the sides of your boat. All other features are the same with this model. The chartplotter always shows your current position with Internal 5Hz GPS/GLONASS which updates your position and heading 5 times per second. DownVu are built-in to the echoMAP CHIRP 75cv enabling you to see directly below your boat or yacht. The maximum depth of the sonar depends on water conditions and is: 2300ft in freshwater and 1100ft in saltwater. You can also connect the CHIRP 75cv chartplotter to work with NMEA 2000 to display engine data, sensors, autopilots and more including distress signals that transmit your GPS location. Plus you can add up a number of waypoints for the chartplotter to store and navigate back to. 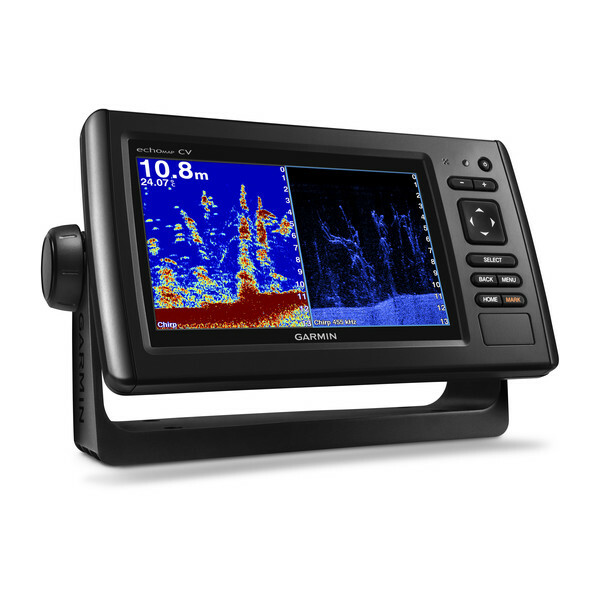 The powering of the Garmin echoMAP CHIRP 75cv is done simply with a power cord so you can simply install and demount the chartplotter quickly and easily. Quickdraw Contours feature enables you to create custom HD mapping with the creation software. 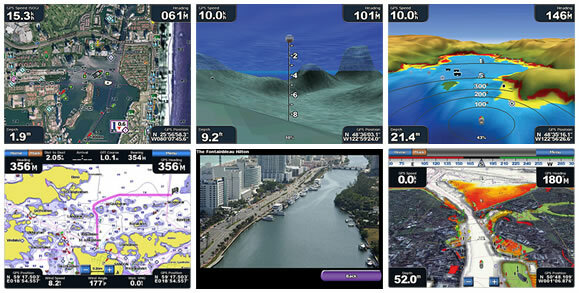 Personalised HD fishing maps feature 30 centimetre contours on screen. 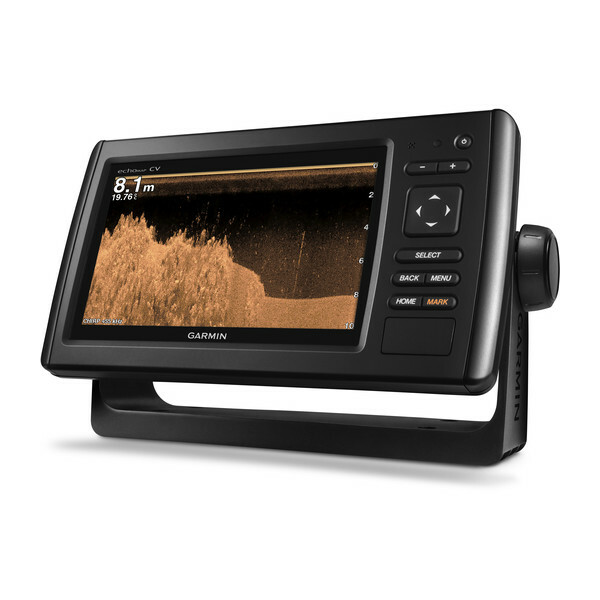 You can use a Panoptix transducer, HD-ID sonar, CHIRP-enabled transducer, Garmin DownVu transducer or a NMEA 2000-compatible depth transducer with the Garmin echoMAP CHIRP 75cv. The Garmin echoMAP 75dv uses GPX Waypoints which enables you to transfer locational information utilising open standard format for waypoints (up to 5,000), tracks (50,000 points, 50 saved tracks) or frequently used routes (up to 100). To find the perfect transducer to partner your echoMap CHIRP 75cv and your boat please complete our online transducer form. Alternatively, if you know which transducer your require (we do however recommend that you complete our online form to find the perfect transducer) you can view the comprehensive range of transducers available buy from ActiveGPS. Pictured below, transom mounted transducer, thru-hull transducer and in-hull transducer. 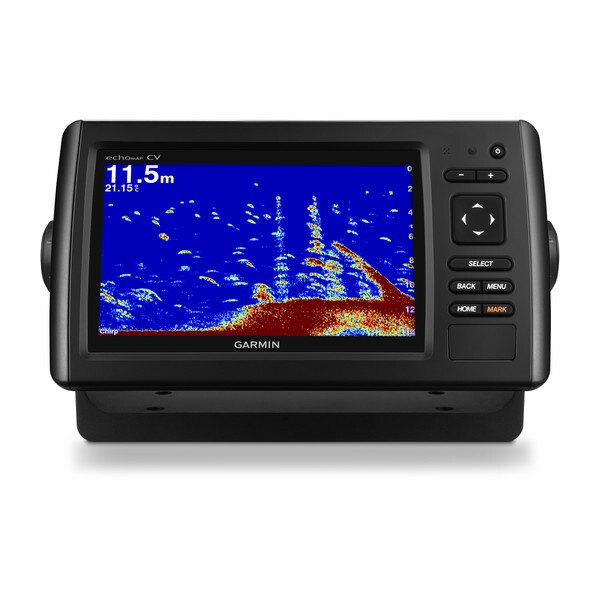 The Garmin echoMAP CHIRP 75cv can be Flush and Bail mounted on your boat or yacht. Use the bail-mount bracket to position the echoMAP CHIRP on a flat surface. Alternatively cut the appropriate sized hole to Flush-mount the echoMAP CHIRP. We advise that you read the manual for specific mounting instructions which explains drill-bit sizes and more to ensure a professional mount of your new Garmin chartplotter. 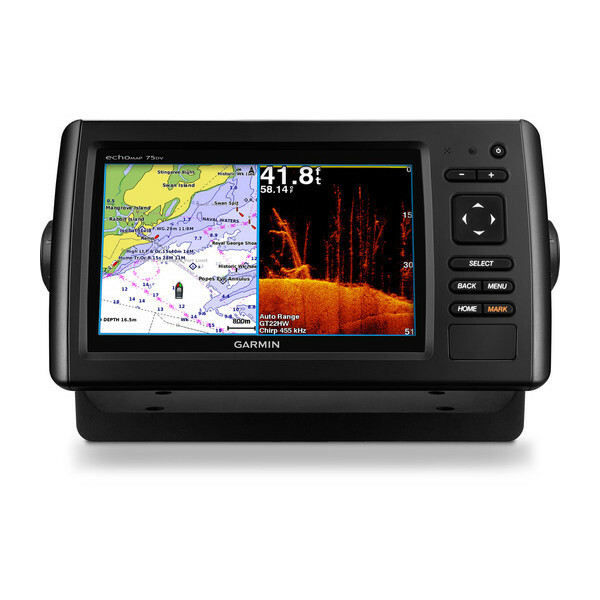 Garmin echoMAP CHIRP 75cv marine chartplotters include BlueChart g2 maps of UK, Ireland and North West mainland Europe coast. 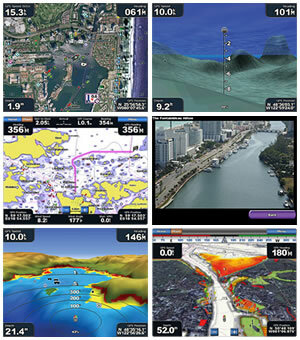 Looking for Garmin echoMAP CHIRP 75cv accessories? Accessories available to purchase include 7-inch protective cover, bail mount (8-pin) and user data sharing cable. If you'd like to add a transducer to your echoMAP CHIRP 75cv please see the Transducer Buyer's Guide. Add Garmin BlueChart g3 and g3 Vision marine charts to your Garmin echoMAP CHIRP 75cv, view the different Garmin BlueCharts you can buy from ActiveGPS.